Aloo Mashla, or Spiced Potato, is a simple side dish that my family cooks with ingredients that we always have on hand at home: garlic, ginger, green chilis and turmeric. We love potatoes and are always looking for different ways to cook it, so the fact that this is such a basic and quick recipe has made it one of our favorites. It doesn’t take very long to make and goes great with Bengali cuisine staples like rice, chappatis, or luchi. We have used a pressure cooker to boil the potatoes. You can also boil it either on a stove or in a microwave. When using a pressure cooker, add 2 cups of water and then add the potatoes. Close the lid and turn on the stove. When the steam comes out, heat for another 3 minutes or so. Turn off the stove and allow a couple of minutes for it to cool, then release the pressure. Carefully open the cooker and use cold water to cool the stove. Skin the potatoes. 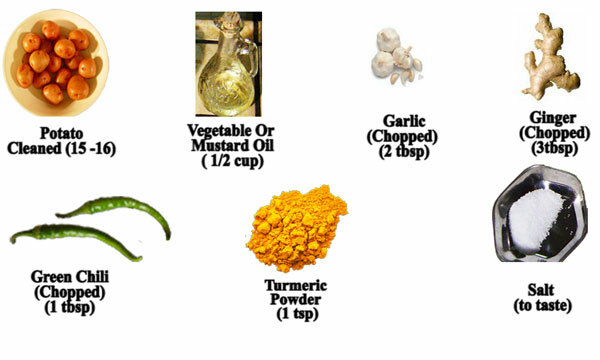 Place a pan on the stove; when it is moderately hot, add oil, garlic, ginger, green chili. Stir for another 30 seconds. Add the turmeric, potatoes, salt. Continue shallow frying for about 10 minutes or so until the potatoes become golden yellow and crusty. 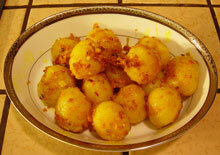 Serve aloo mashla with hot steamed rice or chapatti.